This short entry is dedicated to Summer Hailey who entered the world on June 30th. 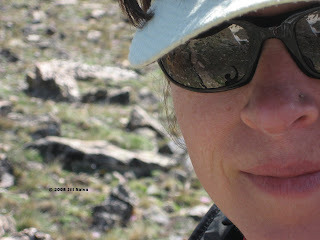 May she grow-up tall and strong just like her way-cool ultra-running mom! This week I got out for trail running, peak baggin’ and stellar lines; nothing unusual, just a few ticks from my lists and a whole lotta fun! So much to climb and so little time! The July 4th holiday brought with it scorching 90-degree temperatures! To escape from the heat, I decided to head up to James Peak for a brisk hike and to take a look at the couloirs (Sky Pilot, Shooting Star and Super Star). 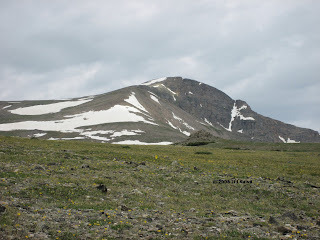 James Peak is the 5th highest summit in the Indian Peaks and also the Gilpin county highpoint. Most people climb it via St. Mary’s Glacier. The crux of the day can be getting a legal parking space. 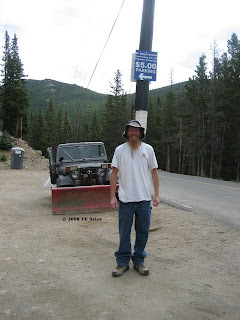 Like many high altitude mountain towns, public parking is non-existent,….except for Paul and Erin Johnson’s property. Paul happened to be on hand today and I took some time to chat with him. His parking lot currently accommodates 30 vehicles. It costs $5/day to park. As a long-time resident of the community, he’s concerned about the environment and decided to take action. He installed a port-a-pottie. When I asked him why he installed the port-a-pottie for such a low volume of visitors, he explained that over the years the number of visitors has steadily increased. Some sources estimate that well over 20,000 vehicles drive up to the community of St. Mary’s Glacier each year and there are no public restrooms. With those kinds of numbers, it doesn’t take long for the human impact to take a serious toll on the environment. Paul shared some of his future plans with me. These include the installation of a self-pay station and perhaps one-day building a retaining wall on the perimeter of his land. Although commerce appears to be lacking in St. Mary's (the local store lasted less than two years) there are "rumors" that the ski area may re-open. Bidding Paul a good day....I walked toward the trailhead. With a mere 3/4 mile hike to reach St. Mary’s Glacier I choose to walk directly up the glacier itself. The surface was firm with just a few centimeters of boot penetration. No crampons were needed. Moving up and into the moist Jamaica flats revealed alpine wildflowers galore! 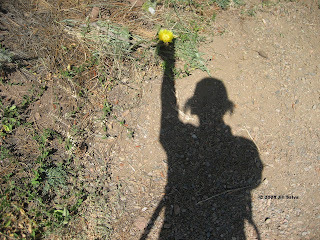 I observed Alpine Larkspur, what looked like Elephant’s Head, Parry’s Clover, Alpine Sunflowers, Asters, and more! Besides their visual splendor, many of these have their own distinctive fragrance. The closer I got to James Peak the cloudier it became, and the more obvious it was that couloir climbing would have to wait for another day. (Retreating down a couloir can have serious consequences and that's no place to be in stormy conditions.) Being observant and hyper aware of the weather I decided to push myself, aerobically, by ascending the more gentle SE slopes. Quickly, quickly I rose higher and higher. It always feels so good to be in the alpine! There is a euphoric-like sensation that comes upon me. This inexplicable serenity washes over and through me removing space, time, and all material things. With the weather changing quickly it was time to descend back to the trailhead. Will the snows come early this year? Please, let it be so! When you look up the word “summer” in the dictionary, you should see a picture of a person with the word July stenciled on their sweaty forehead. That’s right, a close-up photo of a big forehead covered in teeny goblets of sweat! With lowland temps hovering in the upper 90s, we decided on a grueling trail shuffle using this heat as a stressor…..in preparation for our projects later this year. We both prefer cooler weather and were sweating like pigs even before leaving the trailhead. How does one train for the scorching heat of desert sands? Maybe djellabas would have kept us cooler than our tech fabric shirts and shorts. A cold beer would have been good. Along the way we saw countless sub-alpine flowers and slews of flittering butterflies, flying ladybugs, and even a pack of ravens making throaty purr-like sounds as they surfed invisible thermals. As we pounded down the last bit of the trail, a snake slithered out underneath my foot causing me to let out a loud, girlie scream!